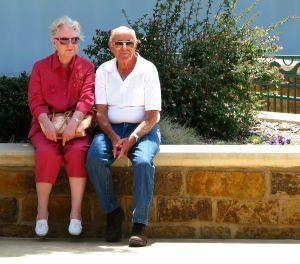 Uncle Sid and Aunt Sadie are in their eighties and have been married for more than sixty years. They have farmed all their life and live a very simple life. Their white frame house is not a show place, but it is a comfortable place to go and visit. Aunt Sadie will have tea cakes in the cookie jar, which she will offer you along with a cup of strong black coffee brewed on the electric range in a tin coffee pot. Both are what you would call "the salt of the earth" and their daily routine involves a lot of sharing which is one reason they have survived for so long. The other day Uncle Sid decided to take Aunt Sadie out to eat. They had never visited a fast food restaurant before and he decided to take her to the Burger Doodle in town. As they entered the establishment that caters to a more younger crowd, heads began to turn. With their simple clothing, and not so spry walk, the younger folks noticed right off that this couple from the farm was somewhat out of place. However, Uncle Sid walked right up to the counter an placed his order. He ordered one hamburger, one order of French fries (taters as Uncle Sid called them), and one soft drink. After getting his order, he and Aunt Sadie took a table near the back wall. Uncle Sid unwrapped the hamburger and cut it in half. He then placed one of the halves on a napkin and gave it to Aunt Sadie. He then counted out the fries into two separate piles and placed one of the piles next to Aunt Sadie's hamburger half. He then took a sip of the soft drink. He gave it to Aunt Sadie and she took a drink. Then they set it down between them and Uncle Sid began to eat his hamburger and fries. During all of this preparation to eat, a young married couple across the restaurant had been watching them. They were concerned about the old couple and came to the conclusion that Uncle Sid and Aunt Sadie could only afford one meal between them. The young man approached Uncle Sid as he ate his hamburger and offered to buy them another meal. Uncle Sid thanked him and told him they were just fine. They were used to sharing everything. As the young man returned to his table, his wife noticed that Aunt Sadie hadn't eaten a bite. She was just sitting there watching Uncle Sid eat and taking a sip of the soft drink when it came her turn. Again the young man came to their table and offered to buy them something else to eat. This time Aunt Sadie told him thank you, but they were just fine and shared everything together. Uncle Sid finished his hamburger and was wiping his mouth off when the young man came back to the table for the third time. Again he offered to buy food for the old couple and again he was politely told no thank you. He couldn't stand it any longer so he asked Aunt Sadie, "Why have you not eaten your half of the hamburger? You said you share everything. What is it that you are waiting for?" With a grin on her face and a laugh in her voice, she said, "The teeth." Now that's what I call sharing.